The first news "publication" created expressly for Apple Inc.'s hot-selling iPad tablets was unveiled Wednesday — and with it a bold bet that consumers are willing to pay for news and information via the Internet that they have long expected to get for free. With its splashy visual presentation and snappy writing, the Daily is the latest venture from Rupert Murdoch, the chief executive of News Corp., which owns the Wall Street Journal, the New York Post and Fox News Channel and has prided itself on a successful history of bucking trends. The perception that Murdoch hopes to buck this time is that consumers won't pay for general news and information on the Internet. While readers have proved to be willing to shell out for specialty content online, such as that provided by the Wall Street Journal and Financial Times, few have been persuaded to pay for general news and information, the kind that fills most daily newspapers. But the news tycoon has been mesmerized by the iPad's potential for reaching a new generation of readers for whom newspapers are as archaic as land-line telephones. He's spending an estimated $30 million on the Daily in hopes of tapping a national audience of readers who will pay 99 cents a week for the app that will provide general news, sports, entertainment and gossip. Murdoch, distraught over how the free culture of the Internet has ravaged the newspaper business, is determined to find a way to put the ink back in the bottle. He has advocated charging for content, delivered to all sorts of devices including cellphones, computers, tablets and e-readers. "The old business model based on advertising-only is dead … that's not going to change even in a boom," Murdoch said last year in an interview with the Washington Post. "Critics say people won't pay, but I say they will. But only if you give them something good." Yet even as curiosity runs high for the Daily, the launch comes amid a backdrop that, when it comes to emerging technology, Murdoch has not so much overturned trends as been overrun by them. News Corp.'s costly acquisition of Myspace, designed to plunge the old media giant into the social media game, has been left behind by Facebook. Its purchase of Gemstar-TV Guide International, aimed at giving News Corp. a stranglehold over electronic navigation of TV programming, imploded amid questions over accounting and lawsuits among partners. A dot-com-era spending spree to push News Corp. into the digital frontier included launching websites and taking a part ownership in WebMD, an online health site that subsequently hemorrhaged hundreds of millions of dollars. One notable exception that didn't backfire is Hulu, the online video site in which the company was a founding partner. News Corp. officials note, too, that the Daily was developed inside the company, extending a business it knows well to a new platform. 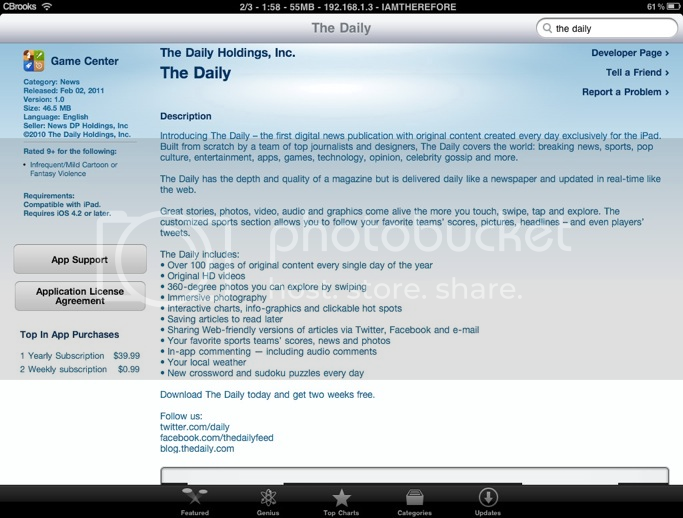 Still, the most daunting challenge for the Daily may not be dispelling the ghosts of News Corp.'s digital past, but rather it will be how it will stand out amid the 350,000 apps available through Apple Inc.'s online store, 60,000 of which have been created expressly for the iPad. "The story really is: How are consumers going to feel about it and will it get traction? Does it have a chance to survive in this incredibly tough, fragmented media market?" said Michael Hayes, who oversees worldwide digital strategy for Initiative, an ad-buying firm. "Our point of view is that these tablet applications … need to be fairly compelling." News Corp. thinks it has done just that, and not with a staff dominated by new media digerati, either, but instead by plucking talent from established publications such as Vanity Fair, Men's Health, Maxim and the Atlantic. Moreover, the Daily is led on the editorial side by Jesse Angelo, recruited from Murdoch's working-class New York Post newspaper. Another top editor on the Daily (even the name reflects Murdoch's roots in print) is Richard Johnson, the Post's former Page Six gossip editor. The 120 reporters and production staff are expected to employ Murdoch's proven brand of cheekiness in writing and story presentation, said a person who has worked on the Daily and who requested anonymity because he is not authorized to speak about it publicly. Certain features bow to the new distribution platform, such as a review section for games and iPad applications, the person said. Indeed, the Daily is drawing upon two news media — print and television — at which Murdoch has long been adept, and forming a hybrid designed for the iPad. The app will experiment with new forms of visual storytelling that take advantage of the iPad's color screen and tactile interface. One design feature will be a 360-degree photograph that readers can rotate and examine as they might a shell on the beach, the person said. "It's going to be a brand-new piece of journalism," James Murdoch, the CEO's son, said recently during the DLD conference in Munich, Germany. "We want to get out there quickly, at a good price, and I think it will surprise people. I also think it will succeed or fail on the journalism part — not the bells and whistles." Alan D. Mutter, a former editor for the San Francisco Chronicle who now consults on new media ventures, applauded News Corp. for creating a news app that takes advantage of the iPad's multimedia and interactive capabilities. But he noted it will compete with alternative news sources, such as the Huffington Post, that are likely to eschew charging for content — not to mention the plethora of well-established brands, from Google News to the local paper, that already deliver a general-interest news product. "The Daily will have to be a breakout product to break the longstanding habits of avid news consumers," Mutter wrote on his Reflections of a Newsosaur blog. Murdoch's mantra has been that people will pay for "quality" journalism. The Wall Street Journal online, for example, boasts more than 1 million paying subscribers — helped, in large measure, by company-paid subscriptions. And since erecting pay walls last July, the Times and the Sunday Times in Britain have attracted some 105,000 purchases — about half of which were monthly subscriptions that would provide readers access online and on the iPad or Amazon Kindle, according to a spokeswoman. The rest were daily purchases, making it difficult to assess the long-term viability of the pay wall. The spokeswoman declined to say whether the publications have lost advertising because of a decline in online visitors. Web traffic plunged 60% to 90%, depending on the estimate, after the pay wall went up. Publishers of other major newspapers have come to a growing consensus that to survive they need to charge for news published online and delivered to portable devices. The economic realities are impossible to ignore. Traditional print advertising has declined to half of 2005 levels, according to the most recent revenue figures reported by the Newspaper Assn. of America. And online advertising isn't picking up the slack: Barely 10% of newspaper advertising revenue came from the Web, after a 10-year effort.